What is Primary Years Programme (PYP)? The PYP represents a combination of research and experience, which includes excellent practice derived from a variety of national system and independent schools from around the world. It is an international, transdisciplinary programme specifically designed for young learners between the ages of 3 and 12 years. The PYP focuses on the total growth of the developing child, touching hearts as well as minds and encompassing social, physical, emotional and cultural needs in addition to academic welfare. The PYP curriculum has an international perspective where the diversity of student experiences and backgrounds is welcomed and celebrated. A PYP school strives towards developing an internationally minded person who demonstrates the attributes of the Learner Profile. The PYP curriculum framework allows students to acquire essential skills in an atmosphere where deeper understanding of concepts is nurtured. In the PYP a balance is sought between acquisition of essential knowledge and skills, development ofconceptual understanding, demonstration of positive attitudes, and taking of responsible action. PYP educators build on students’ prior knowledge and provide opportunities for students to build meaning and refine understanding. Through structured inquiry, the students engage in purposeful learning as they develop an understanding of the world around them. Simultaneously, they learn valuable communication and collaborative skills so they will be able to engage fully with our ever-evolving world. At the heart of the philosophy of the PYP is a commitment to structured inquiry as the leading vehicle for learning. The PYP is a transdisciplinary programme which is organized around six themes that are of global significance. Within each theme are Units of Inquiry (UoI) for each year level, which when combined make up our Programme of Inquiry (PoI). The PYP framework recognizes that individual subject areas have value in themselves, and they also provide students with knowledge and skills to explore the six transdisciplinary themes. Students are made aware of the links to other areas of the curriculum in order to understand the interconnected nature of the subject areas both with one another and with the transdisciplinary themes. Furthermore, PYP students explore subject areas through the Units of Inquiry (UoI), often in ways that transcend conventional subject boundaries. In the process, they develop an understanding of important concepts, obtain essential skills and knowledge, develop particular attitudes and learn to contribute to society. The model below is a visual representation of the PYP curriculum model. 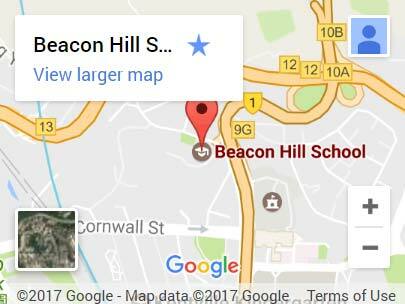 At Beacon Hill Primary the PYP is taught by classroom and learning support teachers, as well as our Mandarin, Physical Education and Music subject teachers. PYP Educators at Beacon Hill Primary promote lifelong learning by encouraging students to be curious and ask questions, knowing that this will develop their capacity to think creatively. We teach students awareness of different ways of thinking and help them to understand the benefits of logical, divergent and creative thought. We encourage reflection upon their thinking and lead them towards an understanding of their own abilities to learn. We teach them how to learn and to understand how learning works best for them as an individual and encourage the development of positive attitudes towards people and the environment.